Me and Brad was sat discussing some summer time recipes, as it is now getting too hot to want to eat let alone even be standing around cooking. 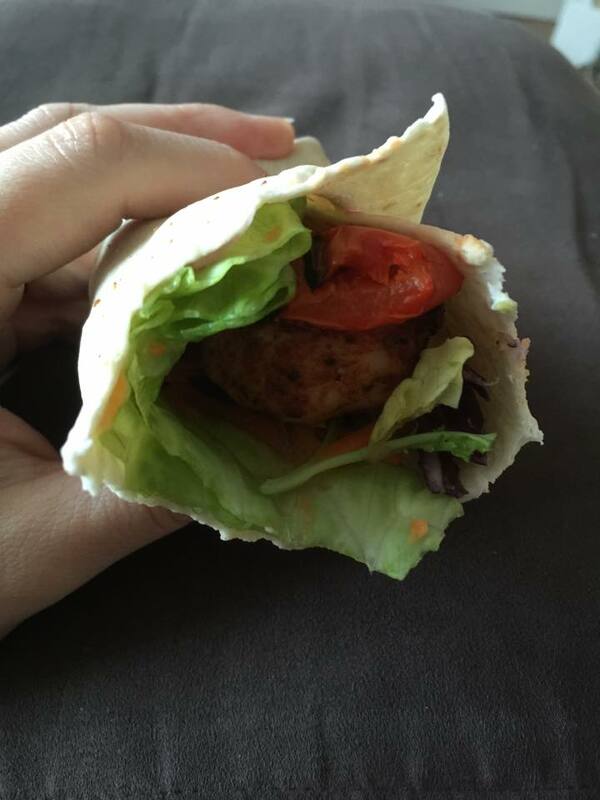 The boy’s enjoy eating wraps so we thought we’d make a nice tortilla recipe and make a chicken shish kebab with a salad for dinner. Instead of using pitta bread we thought we’d use tortilla wraps for a change. We started off by cutting our ingredients to size to make it easier when loading our skewer. Seasoned our chicken with a chicken seasoning. We then got loading the ingredients on, pepper, chicken onion and then repeated until we had no room left on the skewer. Bradley really enjoyed doing this, it was a great team effort, I done the chopping and Bradley done the loading of the skewer. I done the first one to show him how to do it and then Brad took over and finished the rest off. 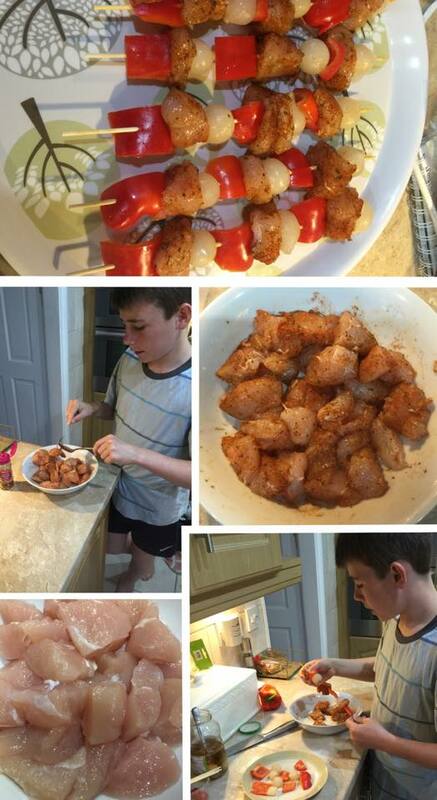 Once the skewers was made we then placed them in a dish, covered them in cling film and then popped them into the fridge until we was ready to cook. We then prepared a salad to go with our chicken shish kebab, we got washing and chopping to create a lovely choice of salad. 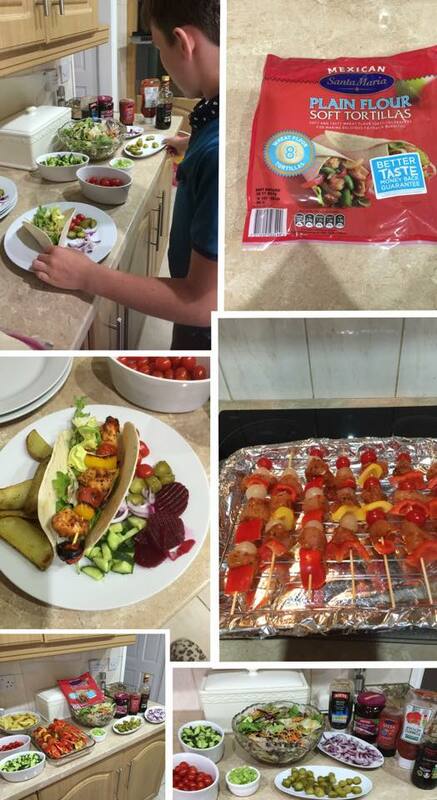 We really enjoy creating a fakeaway, Bradley wanted to create a kebab shop, even naming it “Brad’s kebab’s”. The boy’s was wanting wedges with their kebab so we then chopped up some potatoes to make our own wedges to have on the side. Once the salad was prepared and everyone was ready to eat we then cooked our chicken shish kebabs under the grill. We placed the skewers on a grill tray and then put them under a medium grill heat turning to make sure they cook through thoroughly. When ready we then placed them on a bed of salad inside a tortilla wrap and added the wedges on the side. Prep time: This meal was very much enjoyed by all, it took about 15-20 to prepare and about 12-15 minutes to cook. This meal can be enjoyed as an indoor meal or even enjoyed outdoors at a lovely BBQ. You’ve made me hungry! These looks great I love chicken kebabs but never bothered to make my own. I’ll have to soon. That looks really nice and easy to make! Great for a busy day! This looks delicious. I will be trying this recipe out for myself.